Sources at first suggested that Nicki Minaj would pay "Shether," Remy Ma's Nicki-directed diss track, any mind. But then Nicki dropped "No Frauds," and the Remy-Nicki beef was back on. 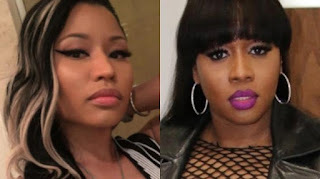 Nicki Minaj continued her clap back on Instagram, where she posted a lengthy rant on Remy: "Here at Young Money, we don't do diss records, we drop hit records and diss you on them," she wrote, "Queens don't move on peasant time. Queens shut down Paris, then drop hits on #QueenTime...Stay in your bum a** place. Jealousy gets you nowhere."